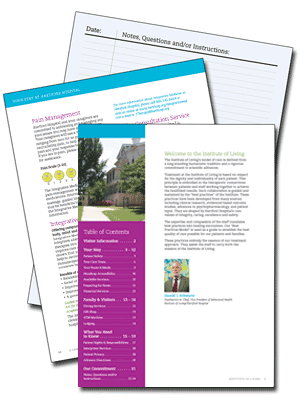 The Institute of Living is committed to providing the best and safest patient experience. We believe that actively involving patients and families in their own care improves the patient’s experience of the hospital and overall patient safety. When patients are engaged as active participants in their own care, they are more informed of treatment choices and possible complications. This Patient Health Care Guide & Journal, available in both English and Spanish, is a tool that we have developed to improve communication among staff, patients and families. Patients receive a copy of the Journal when they are admitted. 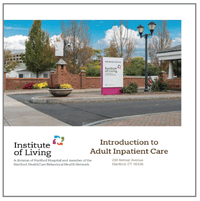 This Introduction to Adult Inpatient Care was developed to provide useful information for adult inpatients being treated at The Institute of Living. 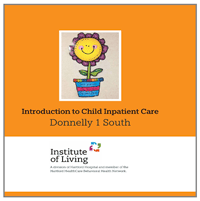 This Introduction to Child Inpatient Care was developed to provide useful information for child inpatients being treated at The Institute of Living.